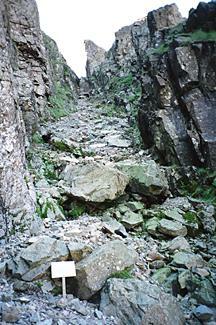 The picture on the left was taken before the rockfalls of 2001/2 and the one on the right, after. It is not obvious from the pictures but there is a great deal more rubble in the rake than there was. It does now have boulders precariously positioned and expected to plunge down with little warning, crumpling any unsuspecting walker. The sign warns that the rake is unsafe and should not be used. The main route now for walkers heading for Scafell from the Pike is via Foxes Tarn on the other side of Mickledore (details). Should it become safe again there is no chance of getting lost on this first part Lord's Rake, but after reaching the top, remember that there are two downs and two ups on the rest of the route to Scafell's summit. 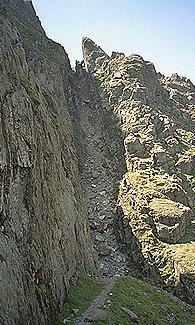 The West Wall Traverse - previously my own recommendation - leaves the Rake to the left, near the top, and heads into Deep Gill.